A stunning picture of a huge mountain, about 150 km across and 4 km high, has been released by the US space agency, captured during the New Horizons flyby of Pluto. Scientists believe it could be one of two potential ice volcanoes that once erupted molten ice from the interior of the distant world. The highest-resolution color image of the giant mountain, informally named Wright Mons, with a wide, deep summit depression, was captured in July 2015. 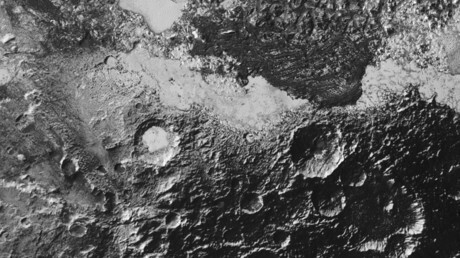 If it proves to be a volcano, it would be the largest such feature discovered in the outer solar system, researchers say. Broad mountains with summit craters are found elsewhere in the solar system, such as the active shield volcano Mauna Loa (the largest volcano on Earth) or giant Olympus Mons (the youngest of the large volcanoes on Mars). According to NASA scientists, the striking similarity of Pluto's Wright Mons and nearby Piccard Mons to large shield volcanoes suggests the two could be giant ice volcanoes, also known as cryovolcanoes. Some details of the photograph captured by the New Horizons spacecraft have left scientists quite clueless. “Mission scientists are intrigued by the sparse distribution of red material in the image and wonder why it is not more widespread,” NASA said. 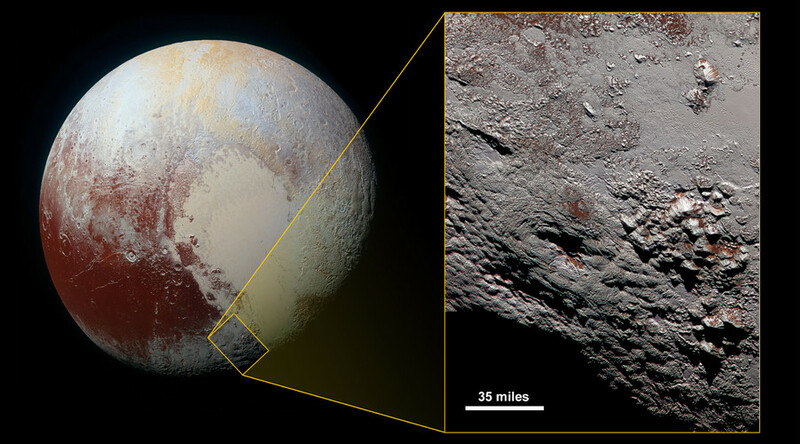 “This may indicate that Wright Mons was volcanically active late in Pluto’s history,” according to scientists. Wright Mons was named by the New Horizons team in honor of the Wright brothers, the US aviation pioneers credited with inventing and building the world's first successful airplane and making the first powered, sustained and controlled airplane flight in 1903.